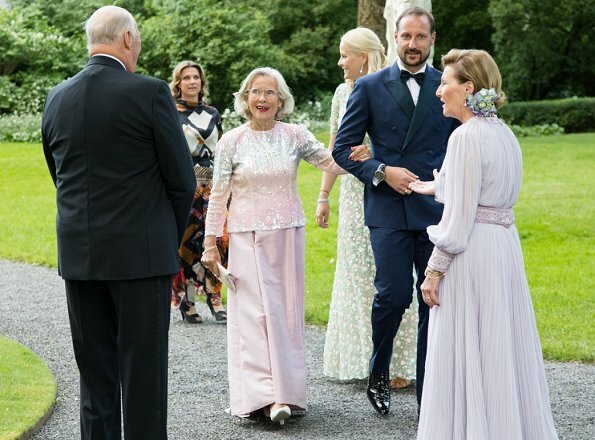 On July 04, 2017, King Harald, Queen Sonja, Crown Prince Haakon, Crown Princess Mette-Marit, Princess Märtha Louise and Princess Astrid, Mrs Ferner attended a gala dinner that held at Bygdø Royal Farm, on the occasion of Queen Sonja 80th birthday. 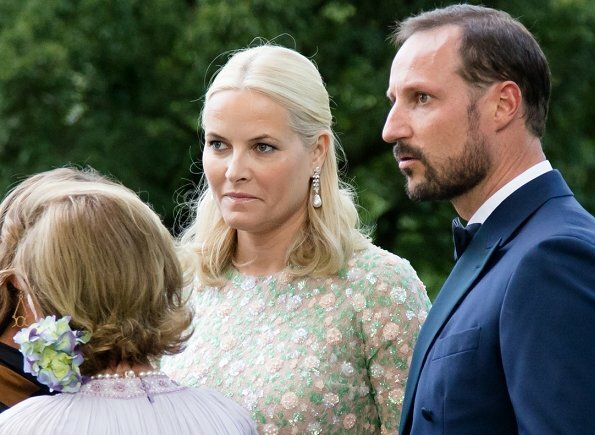 Crown Princess Mette-Marit wore a hand-embroidered dress by Sandra Mansour. Not crazy about Mette's dress, doesn't do much for her. Queen Sonya looks good. Martha Louise's dress is beyond words!!!! Just me: MM's dress may be nice but not on her. It attracts the eyes to her big bosoms and doesn't look right at the waist. Sonja's dress should have been shorter or longer and the floral bunch in her hair looks rather silly. Martha Louise's dress is quite something, I just don't know what, but it suits her. She's a beautiful woman who can get away with it. Lizzie, totally agree with your comments. On point. Well said @lizzie, exactly my thoughts. MM's dress is quite nice for a young slim lady, it looks fresh and delicate on the model in the shorter version and the short fluffy sleeves, it looses everything in the long version and does not look good on MM at all. Too tight on the upper arms and bust and does not flatter her figure. The designer or seller should have told her as she seems to have a wrong body perception. I also agree with you on Sonja's Dress, the whole look is rather silly. I also agree with what you said for Martha Louise, she looks beautiful with a unique style. I agree with lizzie and Beth. MM's ist dress is really lovely but too tight again and the colours wash her out. I can imagine the dress looking excellent on a woman with stronger colours like CPs Victoria. Sonja almost never puts a foot wrong when it comes to day wear but seldom has a lucky hand with her evening gowns, too many of them are kitsch as kitsch can. Maerta Louise is among the very few women who can wear this dress. I don't mind Martha-Louise's dress - it's very "her". Her hair and make up are lovely. As to the Queen, contrary to previous commenters I don't like it - I don't like the length which I find a bit juvenile and I don't like the puffy floral accessory in her hair. MM looks lovely - I like the detail on the dress. I don't understand why everybody is going on about Queen Sonja looking younger than her age. I think she looks exactly her age, without having done too much surgery as far as I can see. She was lucky enough to lead a good life without hard work. And she does not make the fault to dye her hair too dark, as it is often the problem with Silvia. Times have changed. You can find many women in their seventies or early eighties who look as good as Sonja. But to tell the truth, it does help if you have money. It may be more difficult if you have worked forty years on the fields or in a Supermarket checkout. I am 80 and look every single day of it. I am sure that if I had had the money, I would have been able to take great care of my skin, my hair, my teeth. I also worked from the age of 16 to 65. However, all the money in the world would never convince me to have plastic surgery - not saying that Sonja did. A year ago, I had very necessary minor, not cosmetic, eyelid surgery - my lashes kept falling in my eye, causing me to tear up all the time - it was very painful for about 2 weeks, and I swear I could/would never go thru plastic surgery just for cosmetic sake. Beth, I sign every word of your comment. Queen Sonja looks lovely. I like her dress very much. Beautiful fabric and colour. Personally I don't like Martha-Louise's dress, but she is a lovely princess. MM is beautiful, but I agree with Kteach. 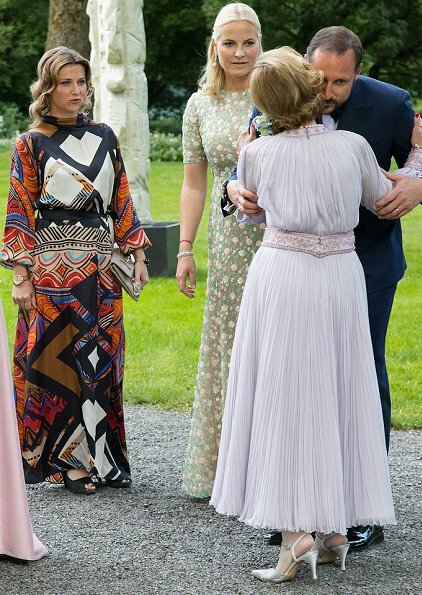 Love Märta's dress! Anyone knows where it's from? Mette-Marit whole look is super, she looks soft and nice. Sonja looks so good as 80 years old. Dress is nice color but I would have make it longer. 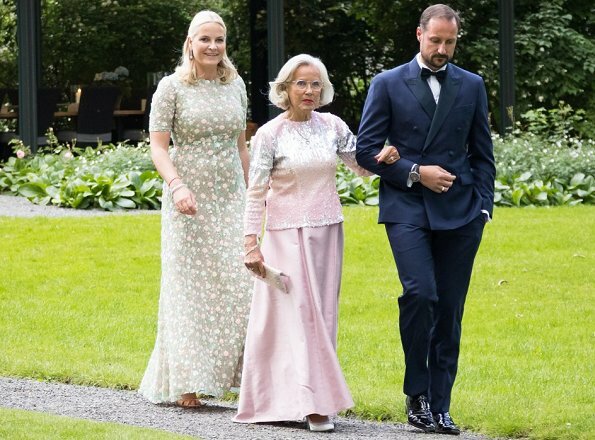 Mette Marit and Martha Louise have dresses very much looking like themselves, I like more about MM´s but can also stand ML`s. All the dresses looked good until the full length photo of Sonja's dress - wish it were full length then all would have looked good. I am absolutely enchanted by the bodice of Sonja´s dress. But the skirt part really needed to be floor length to be elegant. My overall winner is therefore Märtha-Luise, in a gown that´s totally her, that´s also flattering and a perfectly fine choice for a private birthday dinner celebrating her mum. The gentlemen´s suits look terrible - poor material, poor fit. 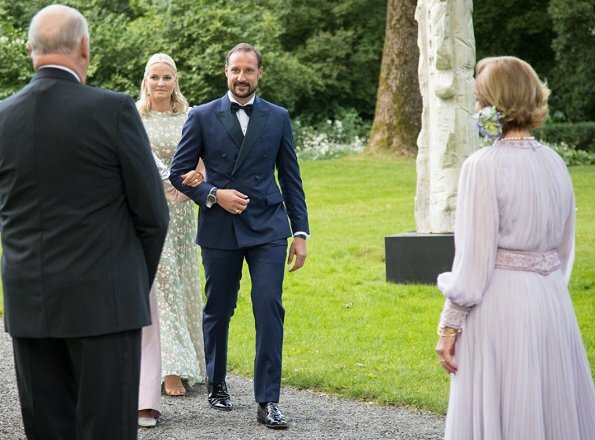 You are so right about the gentlemen's appearance, both Harald and Haakon wear terrible suits. My first thought was that the queen looked really charming and cute, but maybe that isn't a look to aim for at her age [certainly not "cute"!]. It is a smidgen juvenile, perhaps. I don't like Martha-Louise's dress but she looks good - very young! I've been puzzling what to say to improve the look of MM's outfits. The model's version of her dress is really nice and I think if she had kept that shoulder line - extended - and then added a little fuller sleeve from it, her fuller biceps area wouldn't be so obvious. A slightly padded shoulder, extended, would help balance her look, don't you think? I have a similar problem and it isn't fun trying to find a decent-looking top. Who is the Lady on Haakon's arm? Perhaps Mette-Marit's Mom?? Yes, that is Mette-Marit's Mother. I can't say I like any of these. MM's is terribly, terribly fitting. 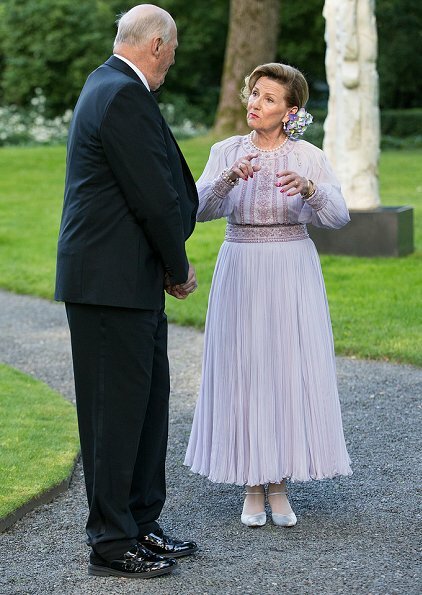 Queen Sonja looks like she's trying really hard to escape her age by dressing like a woman half her age. Martha's dress I suppose is tolerable, but nothing is classy about it, rather cheap looking too.